The last time Christian Hackenberg threw for at least 200 yards in regulation in a regular-season game was a year ago. OK, 51 weeks ago, to be exact. It was Sept. 27, 2014, when Hackenberg threw for 216 yards on 22 of 45 passing in Penn State’s 29-6 loss to Northwestern. When San Diego State visits Beaver Stadium on Saturday, it will be the one-year anniversary of Hack’s last 200-yarder that wasn’t in the Big Apple or didn’t go into overtime. That OT game was in 2014 against future national champion Ohio State. And all he did then was complete 15 of 23 passes for 108 yards, including a 19-play, 77-yard drive that culminated in a 31-yard field goal by Sam Ficken that sent the game into overtime. When we last saw Penn State’s quarterback at his best, he was throwing for 372 yards and four touchdowns in Yankee Stadium. That’s in just one Pinstripe Bowl. The Stripe-Out on Saturday was a different story. The Kid’s lost it, right? Caveat emptor: It was a driving rainstorm, Penn State’s running game was finally untracked and Rutgers was going nowhere. Fast. And besides, he was busy being a game manager. “I think he’s managing the game really well,” his head coach, James Franklin, said after Penn State’s convincing 28-3 victory over a Rutgers team that was, honestly, in shambles. The result was 195 yards and two touchdowns from Saquon Barkley and 121 yards and a TD from Akeel Lynch. But, once again, the Hack that Penn State fans came to love and know under Bill O’Brien – and who showed flashes of his old self in Dublin, New York City, Piscataway and that big drive vs. Urban in 2014 – was washed out. In his first 17 games and 17 starts at Penn State, Hackenberg threw for 300 yards in seven different games and for 200 yards 13 different times. Now a junior, he has thrown for 372 yards in 2015. That’s the entire 2015 season. That’s 103 at Temple, 128 vs. Buffalo, 141 vs. Rutgers. Since and Northwestern in 2014, he’s had passing games of 160, 189, 177, 168, 112, 93, 195, 103, 128 and 141 yards. That’s an average of 147 yards per game. In the games up to and including Northwestern, he threw for 278, 311, 262, 176, 340, 305, 112 (a 63-14 loss at Ohio State, where he was knocked out early), 240, 163, 212, 217, 339, 454, 319, 309, 179 and 216 yards. That’s an average of 260 yards per game. Christian, we hardly knew ye. If there is anyone who has taken it for the home team the past three years, it’s Hackenberg. He came and stayed at Penn State in the face of sanctions, he stayed after his Yoda left, he got Sackenberged last season and The Linc, and now he’s passing the ball with the frequency of those great Penn State game managers, Tom Sherman and John Shaffer. True, he’s short-hopping the ball. And he was holding the ball too long. But if it were you or I or 98% of all college football QBs everywhere, we’d be Chuck Knoblauch by now – unable to get the simple out at second. But Hackenberg has stood tall in the pocket, taken his lumps on and off the field, and been a leader. Always. Saturday night, ringed by about a dozen reporters instead of the usual 30 or so in the post-game interview room, Hackenberg said the only number he cares about is two – as in two wins the past two weeks. Don’t believe that the numbers don’t matter? Brian Gaia, the fourth-year guard who’s known Hackenberg for every day of his Penn State life, believes. “Hack’s awesome,” Gaia said after the game to a trio of reporters. “Hack is the ultimate team player. He’s not going to take his stats over winning. He’ll take a W any time. Hackenberg didn’t bite when asked twice about Franklin essentially calling him a game manager – very often a pejorative statement in football circles. Didn’t even flinch. His first opportunity came 2 minutes and 23 seconds into the post-game Q&A. “That’s the role I’ve been asked to play and I don’t think that’s a bad role at all,” Hackenberg said. “Usually the game manager is the guy who gets us in the best play where we can be successful as a team against the look we’re getting. Two minutes and 42 seconds later, a TV guy with a big mustache and a big ego rushed over, stood next to Hackenberg (to get into the shot, I presume) and shoved his microphone in the quarterback’s face. Hack didn’t move. This game manager thing is ultimately by design. If Penn State is going to have any hope – any hope – of beating the Murderers' Row of Meyer, Dantonio and Harbaugh, and maybe even Northwestern and Maryland on the road (in strangely disparate and challenging venues), its offense is going to need a running game. They didn’t last year and paid for it with a 2-6 stretch. Franklin is the king of bench-marking and doing the metrics on that in the offseason had to be painful. Or at least should have been. Saturday night was the time to get that going. Franklin gets that. Hackenberg gets what that game manager thing is all about, too. To both of their credit and for the team’s success, the coach and the quarterback – who, stop the presses, don’t always see eye-to-eye -- are making sure the quarterback is making a lot more play-calls and play-changes at the line of scrimmage. If Hackenberg sees a lot of defenders swamping his outside receivers, he can change the play to a run – as he did in the audible that led to Lynch’s 75-yard come-to-dinner TD sprint that sealed the win over Rutgers just before halftime. It’s not just trusting Hackenberg to make the call; it’s trusting the players around him will get what to do as well. Among them was the 48-yard catch-and-dash by DaeSean Hamilton, back as an integral part of the offense. He had a team-high five catches for 86 yards. “Hack adjusts to it very well,” said Hamilton, a smart player himself who has a very tight bond with his quarterback on and off the field. “He has a lot more freedom at the line of scrimmage now. He’s making checks and outing us in the most advantageous situations. It really paid off. 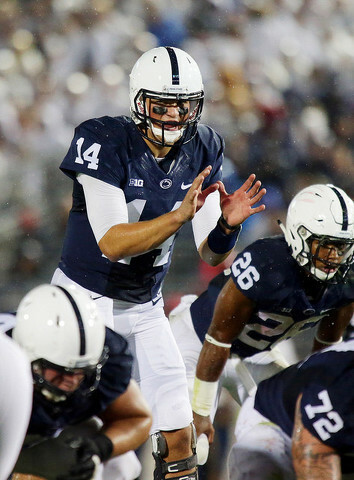 Even though Hackenberg is not passing the ball with the frequency or success that he did as a freshman, he feels that he is – once again…finally – in charge of the offense. Changing plays and formations and options at the line of scrimmage is nothing new for Hackenberg. It’s just new for him under Franklin and offensive coordinator John Donovan. “I did that a lot my freshman year,” he said. “Last year was kind of tough, we just felt things out. It’s something we can expand upon this year and be an asset to us. That response was the only time Hackenberg let his neatly-coiffed hair down in the interview and didn’t seem like he was on QB Speak. Phrases like “exotic pressures” and “schemes” get his blood going in a way that may not have been the case since Dec. 31, 2013. So, where does the newly-anointed Game Manager go from here? I’m reminded of 1982, when Penn State came out of the box hard with a new-fangled passing game under quarterback Todd Blackledge. In a 31-14 season-opening victory against Temple in Beaver Stadium, Blackledge threw for four touchdown passes as his roommate, backfield mate and best friend Curt Warner ran for just 49 yards on 13 carries. Warner was devastated. The tailback from small-town West Virginia was coming off a two-year run of 1,966 yards and was a preseason Heisman Trophy candidate. A genuinely nice, God-fearing and humble man (and still was, when he returned in 2009). Warner was stunned by the shift to what became known as “Air Paterno.” And, uncharacteristically, he said so. In the locker room afterwards (post-game interviews were, indeed, held in the locker room back then), Warner shed some tears and opened up to a small group of reporters, including me. Joe Paterno knew what he was doing, even if Warner didn’t. If the Nittany Lions were going to win the national title, they needed a balanced attack. And that’s exactly what happened. All of it. Penn State ran for 2,283 yards and passed for 2,369 yards on the season. Warner rushed for over 1,000 yards and was incredibly integral to the team’s success and first-ever national championship. He averaged 129 rushing yards over the final five games, against teams like Notre Dame and Pitt. And he was selected in the first round of the NFL Draft that spring and as a rookie was named the AFC’s Offense Player of the Year at the end of the next fall. Let’s be clear. Hackenberg has not spoken out like Warner; he’s largely been a model citizen, given all the changes and challenges, especially given that he’s all of 20 years old. And the 2015 Nittany Lions are not going to win the national championship. Hardly. But a few more 200- and 300-yard games are in Hackenberg’s Penn State future – even if the number of games left is soon down to single digits. And I’m betting when it’s all over, The Game Manager will still need a very good business manager. 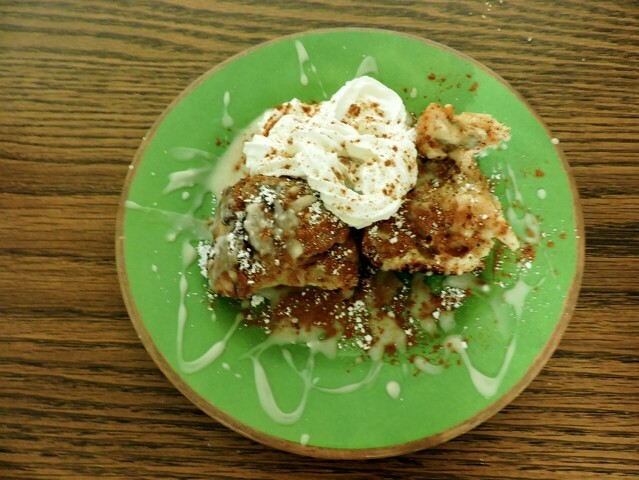 In this week’s edition of Onward Chef, we tackled one of State College’s favorite desserts — the fried, sugary, and decadent Grilled Stickies from Ye Olde College Diner.